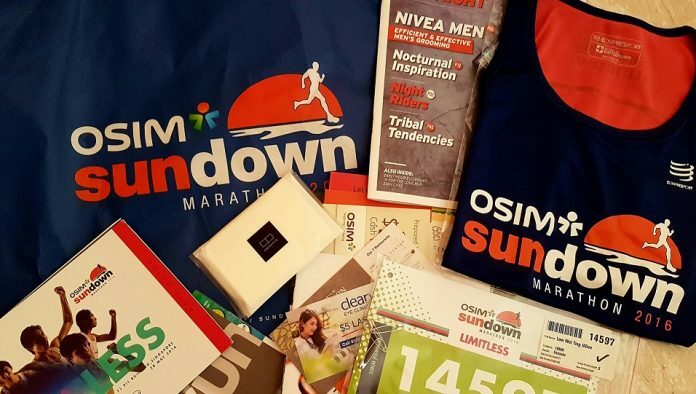 Race Review: OSIM Sundown Marathon 2016 [10km] (by Jillian) | JustRunLah! The night was young, the race carnival filled with people, runners and volunteers of the event. The atmosphere was all vibrant and filled with enthusiasm as runners warm up in prepare for their long distance run. Cheering voices could be heard in the distance as players engage in games such as dodgeball and basketball in the makeshift court outside the F1 pit building where the actual race would be held. The race pen opens at 9.30 pm for the runner of the 10 km race. There was some simple light stretching exercises before runners were flagged off. The level of enthusiasm was high during the first wave, but slowly dropped again as we waited to be flagged off (I didn’t know I was in the third wave as I inched my way forward to the start line with the crowd). As soon as we know that we were about to be flagged off, we got all excited and eager again. Bring on the night race! Roads were cordoned off for the runners and the road was relatively wide. The running route was not congested and it was a really pleasant run. The night breeze was enjoyable and it was a refreshing race without the scorching sun. The race itself required some running up slope, down slope at the helix bridge and also some stairs climbing near Marina Bay Sands. There were about 3 hydration points along the 10 km route. It wasn’t enough in my opinion. It might be because of the warmer weather these days but I’ve since learnt to take 2 cups every time I pass the hydration point. 1 cup of water is not enough. 2 cups of 100 plus left me feeling thirsty and dry mouthed. So the best combination for me was 1 cup of 100 plus first then 1 cup of water. The overall event was enjoyable. Finishers were given their medal and some refreshments at the end of the race. There were even movie screenings at the race village for everyone to enjoy. The volunteers of this event were also friendly and encouraging.